As our nation celebrates Veterans Day today, honoring those who have served in the military, our local Veterans of Foreign Wars Post will be distributing the traditional Buddy Poppies at the Peace and Justice Plaza in front of the Franklin Street Post Office on Veterans Day, November 11th,from 3 to 6 PM. VFW Buddy Poppies are assembled by disabled, needy, and aging veterans in VA Hospitals across the country. The majority of donations received by VFW Posts is retained locally to provide for veteran services and welfare. The minimal assessment (cost of Buddy Poppies) to VFW units provides compensation to the veterans who assembled the poppies, provides financial assistance in maintaining state and national veterans’ rehabilitation and service programs, and partially supports the VFW National Home for orphans and widows of our nation’s veterans. Please come by the downtown Post Office between the hours of 3 PM and 6 PM. This is one of the major annual fundraisers for our Chapel Hill Post, and it is an opportunity for citizens in our community to express their support for local veterans in need. Thank you. A reception will kick off the evening, followed by a lecture, a moderated discussion, and a Q&A session with participants. Gerhard Weinberg, William Rand Kenan, Jr. Professor of History, Emeritus, retired from teaching at Carolina in 1999, but remains active in his field. He is one of the world’s most distinguished scholars of World War II and National Socialist Germany. He is the author of ten books, including A World at Arms: A Global History of World War II, which received three major awards for scholarship, was a Book of the Month Club Main Selection, and is widely considered to be the best single-volume history of World War II. Most recently, Professor Weinberg was awarded the Pritzker Military Library Literature Award, a lifetime achievement prize for excellence in military writing. Held in the Atrium at the Friday Center The Friday Center, UNC-Chapel Hill’s premier facility for continuing education, offers free parking, easy access, and comfortable seating. Tuition is $45. Discounts do not apply to this special event. Hillsborough Grady Brown Elementary School is honoring local veterans on Tuesday, November 12th, at 1 p.m. This annual event is put on by the students and includes comments from the children and singing of patriotic songs. The event is followed by a reception. The school is also the home of the 2013 Teacher of the Year (K-5) for the Department of North Carolina. Small wonder! Let’s give the students our full support. The school asks veterans to wear their hats, bring their medals, and maybe even wear their uniform (if it still fits!). Attendees should arrive by 12:45 for seating before the program begins. Grady Brown is located at 1100 New Grady Brown School Road, Hillsborough, NC 27278. In 2006, C. V. Cummings Chapel Hill VFW Post 9100 traveled to Arlington, Virginia, for the funeral of a member, Carl R. Fritz. We also took time to visit the World War II Memorial. We’ll share a few photos of our trip here. We encourage you to visit the war memorial website. It has a lot of information on its funding, construction, and importance. To visit the site, click here. The memorial’s website is full of facts that you may not know. The section on funding of the memorial is of special interest. Did you know that it was funded almost entirely by private donations as required by Public Law 103-32? The memorial funding campaign raised over $197 million dollars in cash and pledges. “Hundreds of thousands of individual Americans, hundreds of corporations and foundations, veterans groups, dozens of civic, fraternal and professional organizations, states and one territory, and students in 1,200 schools across America” provided the money. The Veterans of Foreign Wars provided over $2,000,000, as did the American Legion. It cost $182 million. All of the expenses of design, building, fees to the National Park Service for maintenance, and the dedication were part of the cost. The remaining funds (then $15,000,000) are held on deposit with the U.S. Treasury in a special National WWII Memorial Trust Fund. Learn more about this special memorial that honors the 16 million service men and women and over 400,000 who gave their lives during World War II. Our slideshow of the 2006 trip shares images of local World War II veterans that joined us on our journey, but have since died. Let’s not let our local veterans miss an opportunity to visit their memorial. Our host American Legion Post is going to have an open forum chalk talk on personal computer use. Post Commander Heavlin will work with post members as they share computer problems and issues with other members. Many user problems are common and shared by others. The solutions are the same. Also covered will be new software solutions that may be unfamiliar to post members. Handheld smartphones are rapidly taking hold and many computer users now use a smartphone or tablet as their computer of choice. For free computer service, click here. A local business is helping veterans and members of Veterans of Foreign Wars with free personal computer repair. That’s right! It is no-cost help. Of course, parts are not included. 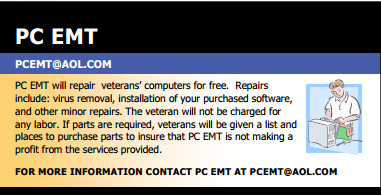 If a veteran’s personal computer needs parts, the repair shop will not sell them the part, but they will give them a list of needed parts and tell them where they can obtain them. Parts will then be put in for the veteran. So, if your personal computer is ailing and you are about to lose control, ask for help before you head to the big box super center to buy a new one. Get some professional help. Your computer may be fine. It could be a software issue or a minor part. The expert advice and assistance is offered by a local Hillsborough personal computer tech. He is offering his no cost repair services to local veterans in Chapel Hill, Hillsborough, and Orange County. Other veterans can get assistance if they are in the surrounding area and contact him for assistance. For Post 9100 members, we can also arrange for you to drop off your computer at the American Legion Post on our meeting night for him to pick up. Make sure you have made arrangements for pickup before you take your PC to the post. Most computer parts, cables, memory, and accessories are available in Chapel Hill at Intrex Computers on Elliot Road at affordable prices and lower than many big box stores. We applaud “Ben” for volunteering to help our post members and other local veterans. And we also thank the Crime Prevention/Training Department of NC Department of Public Safety in Raleigh for sharing this service information. What would you do after your completed a successful 39-year career with IBM that took you around the world? Would you sit back and relax? Not Rusty Edmister.” His IBM experience only prepared him for the most rewarding career of his life. Rusty travels the local area and state serving as a North Carolina State Archives videographer interviewing veterans! Rusty and other area retirees on their second journey in life was interviewed by the Raleigh News and Observer reporter Carol Frey. Read more and be inspired. Attention all local and Orange County Veterans. If you are looking for a job, help is here. It is time for you to dust off your resume, dress for success, and put on that big smile. The Orange County Department of Social Services is hosting a Job and Resource Fair at their Hillsborough office. You can speak to employers ready to hire veterans. More than 30 employers and resource providers will participate. This job fair is open to everyone. Call your friends and share the opportunity. Please come prepared with resumes and dress professionally. For more information contact: Shanika Williams (919) 245-2822 or Randy Haynes (919) 969-3032 ext.